The Cinco de Mayo Pachanga 2007 (Pachanga translates to bash) is the inaugural fund raising event for the Grand Rapids Mexico Sister City Committee. The Committee is in the final year of formalizing a partnership with Zapopan, a city outside of Guadalajara, Jalisco. The Cinco de Mayo bash will be held on May 5th at the Intersection Bar in downtown Grand Rapids. The event will feature live Latin music from La Famiglia, Grupo Falcon and South Side Evolucion. Grand Rapids Community College's Mariachi Azul y Oro also will be making a special appearance. There will also be authentic Mexican food provided from area restaurants including El Ganadero, El Matador and Maggie’s Kitchen. The food will be availalable beginning at 7 p.m. Music begins at 8 p.m.
Tickets to Pachanga 2007 are $25 and can be purchased at all Ticketmaster outlets, as well as participating restaurants. If you show your ticket at particpating restaurants from Thursday, May 3 through Saturday, May 5, you will receive 25 percent off food purchases. The participating "Arena District" restaurants include Bar Divani, Black Rose, Margarita Grill, the B.O.B., Grand Woods Lounge, Louis Benton, McFadden’s, Taps Sports Bar, 48 West and One Trick Pony. 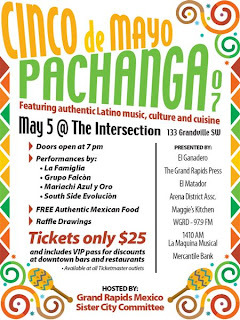 Additional Cinco de Mayo Pachanga 2007 sponsors include the Grand Rapids Press, WGRD, 1410 AM La Maquina Musical and Mercantile Bank.